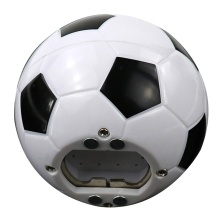 This product has a football modeling, when it opens the beer bottle, the World Cup theme song will sing. It is designed with magnet, can be sticked on the fridge. Having it makes your life more interesting. It has a football appearance. When it opens the beer bottle, the World Cup theme song will sing. It is designed with magnet, can be sticked on the fridge. Small size, easy to carry and easy to use. It will make your life more interesting. It is the best gift for your football fan friends.